The system can be upgraded at any time of the basic version for fix volume injection with sample loop overfilling. Up to variable volumes from 1–100ml (Optional up to 500ml) without changing the sample loop. With the next upgrading step, the S 5200 used for fully reagents can be added to the specified. Sample volume, mixed with sample and programmed with independent reaction time. In addition, the sample can be diluted with more than 100 times (depending on sample volume). 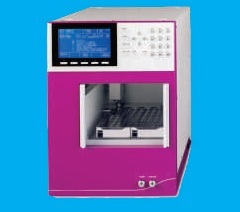 For temperature sensitive sample, the sample try can be cooled or heated with the optional cooling system. For chemical inert operation, the instrument can be delivered for fully metal –free sample handling (completely equipped with PEEK and FEP materials, including sample needle). A wide range of sample operation through large alphanumeric display menu.